Introductory price of $45.00 for this one-of-a-kind workshop! The holidays are quickly approaching, which means it's the perfect time to add a custom piece to your tablespace. Create your own Farmhouse Plank Service Tray at this Holi-DIY workshop. We will guide you step by step through the process to create this one-of-a-kind piece! Make one for you or give as a gift! 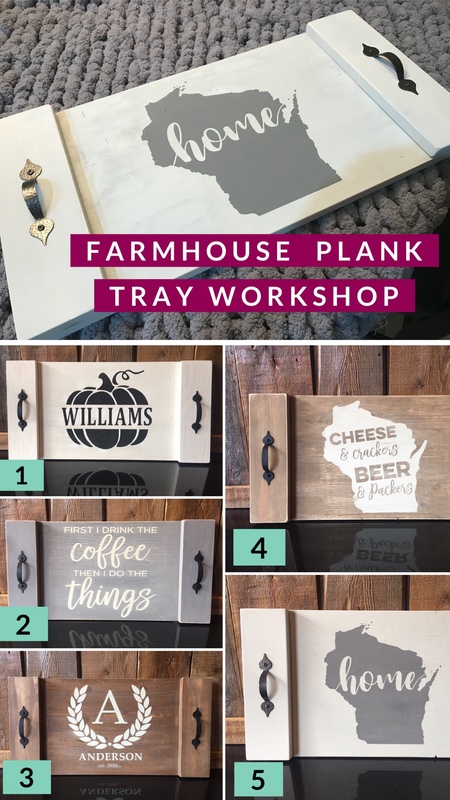 During this workshop you will sand, distress and paint a 24x12 wooden tray before you apply a customized stencil and paint of your choosing! Select from our array of trendy paint colors for your tray and lettering when you arrive in our studio on the day of the event. There are FIVE designs to choose from to customize your tray. Please write in the comments (when you register) your design choice from the list above. If your design includes a last name, please share this as well. Once you have purchased your seat, we will confirm your order and name/date via email!